New Jersey cartoonist and collector John Stinger, recently announced the release of his new book The Lighter Side of Collecting! published by Tanner Publishing. Featuring 200 full page New Yorker-style cartoons and 56 pages of family-friendly humor about the joy of chasing vintage stuff for fun and profit, Stinger takes the reader on a laughing-trip with more twists and turns than a Victorian settee. Designed to appeal to both young and experienced collectors this classic book will entertain anyone who wheels-and deals in vintage treasures. Stingers cartoons can be seen in leading publications serving the collectibles market. He sold his first cartoon about antiques in 1973 and in 1992 published his first book about this fun hobby. The Lighter Side of Collecting! 256 page paperback is $15.95 per copy plus $3.95 shipping. Order today! stingerfineart@yahoo.com. Or call 908-319-8957. 10 % discounts to vets and seniors. 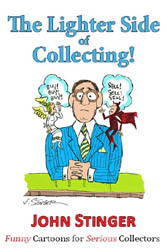 Syndicated cartoonist and collector John Stinger will be signing his new book The Lighter Side of Collecting! at the fun Allentown Paper Show to be held Oct 1 and 2 at the AgriPlex, in Allentown, (Fairgrounds) PA. This is a must attend show if you love old movie posters, sports memorabilia, antique toys, rare books, Civil War collectibles , travel art , and old magazines. John Stinger will be there on both days to personally sign copies of his recently released paperback book published by Tanner Publications that features 200 full page cartoons about the fun of chasing vintage treasures and 60 pages of humorous stories.Bring your family, enjoy the show and meet the artist. Mark your calendars: Saturday October 1 from 9:00AM to 5:00PM and Sunday October 2 from 9:00AM to 3:00PM. Lots of free parking. Three Singer Paintings Available at Baum Art School Art Auction! Three paintings by impressionist John Stinger will be auctioned at the Baum Art School 29th Annual Art Sale including Winter Shadows, New Hope Early Spring and Corn Fields, each 22 x 28 oil on canvas. Silent auction starts at 5:30PM. Live auction begins at 8: 00PM. Proceeds benefit the school. All unsold paintings by prominent participating artists will be displayed at the Rodale Galleries for one week following the auction and will be available for purchase at the opening bid. After a very successful solo show at Stover Mill in September, John will be participating in the New Jersey Plein Air Painters Group Show Nov 2-3, 2013 in Stockton, NJ. Saw Mill Gallery is located in the Prallsville Mill on Rt 29 in Stockton, NJ. He will have three paintings available at the show including "First Snow-Bucks County" oil on canvas 16 x 20 shown here. John's Solos Art Show at the Mill. 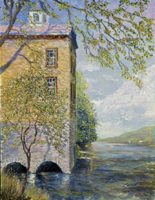 Sponsored by a non -profit civic group, The Tinicum Civic Association is presenting a solo art show of popular Stewartsville artist John Stingers latest plein air paintings at their Stover Mill Gallery in Erwinna, PA located on River Road between the Frenchtown and Milford Bridge crossings. 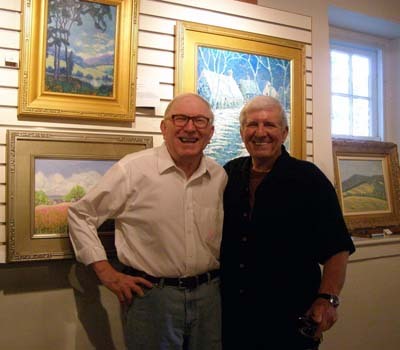 This is their 54th season and Stingers third solo show at Stover Mill Gallery. Hours are 1-5:00 PM Sat and Sun. Stinger will be showing over 50 of his latest oil and acrylic paintings including several entitled,  The New Jersey Shore, Bucks CountySummertime, and The Corn Field ( Warren County). For many years, Stewartsville, NJ artist John Stinger has kept very busy painting beautiful impressionistic landscapes of the tri-state area and exhibiting his work at shows in Philadelphia, Allentown, Bethlehem, and Bucks County and all over New Jersey. 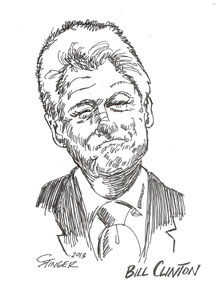 Now, he has added something new to his creative venue: editorial cartoons. 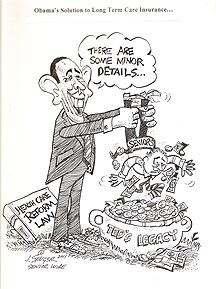 His editorial cartoons appear monthly via Senior Wire Services, a Denver, Colorado based national syndicate that distributes his work to newspapers, magazines, publications and electronic media. One of their largest web site customers www.go60.us features Stingers cartoon called Picture this. Every month, he teams with an editorial writer to present significant national news and political opinions of interest to seniors and active adults. (See sample) The site is entertaining, fun and full of quality information to keep everyone up to date about issues that concern most Americans. Stinger has been selling his cartoons to national publications since he was a teen. In the military, he was selected Top Military Cartoonist for two years; during the 80s, he syndicated a daily business panel to 65 newspapers in the US and Canada; wrote and illustrated his first humorous book in the 90s about collecting antiques, and for the past several years has been selling his monthly cartoon, Collecting Classics to a number of national publications serving the collectibles market. To see more Stinger editorial cartoons visit www.go60.us and click on meet the Writers. For more details about his painting, visit www.stingerfineart.com or call him directly at 908-319-8957 to arrange a studio visit. Classes are available. New Jersey Seniors Art Show: John won the first prize award (professional category) for his painting entitled Winter Morning/ Frenchtown, 16 x 12 oil on canvas. The painting is on display and for sale at Wayne Dumont Administrative Building Route 519, Belvidere, NJ. Show, The Show opened April 27th and closes June 29th. Call 908-453-4381 for more details. After the show, Johns painting will be entered in the NJ State Council of the Arts Show, by the Warren County Cultural and Heritage Commission, sponsor of the Seniors Art Show. Both agencies partner with the National Endowment for the Arts. On May 21, John will welcome the Washington, NJ Womens Club during a visit to his studio. He will show paintings in progress as well as talk about plein air landscape painting to this group of local business women. Last year, he was invited to speak at the club where he showed numerous examples of his landscape paintings and discussed the business of art. John recently entered three of his paintings in the 15th Annual Warren County Art Show May 12-June 30 at the Oxford Municipal Art Gallery, Oxford , NJ . An Artist reception for all participating artists is scheduled for June 3rd, 2:00-4:00PM. Johns paintings include : Bowmans Tower/ Delaware River, 12 x 16 oil on canvas; A New Day/ Bucks County 12 x 16 oil on canvas and Rising Moon, 11 x 14 oil on canvas. Warren County Division of Aging: Every Wednesday in June, John will demonstrate painting for seniors at locations throughout the county including Washington (6/6), Belvidere (6/27), Hackettstown (6/20), and Phillipsburg (6/13). For more details if you care to visit, please call him: 908-319-8957. Tinicum Arts Fest, July 14 and 15th at the Art Barn in Tinicum park, Rt 32 River Road, Bucks County /Erwinna, PA. John will show one new painting entitled, Summer Afternoon along the Delaware. Oil on canvas, 22 x 28. Hunterdon County Library: September 2012 Art Show: John will co share the space at the month long show held in Clinton, NJ and will feature 20 of his latest landscape paintings including several brand new works that incorporate his cartoons in pop culture subjects. More information will be released in August regarding Johns unique paintings to be featured at this show. 32nd Annual Mountain Art Show, St John on the Mountain, Bernardsville, NJ. October 26-November 4, 2012.  John will be submitting three paintings (to be named) at this wonderful juried show and will keep you posted re more details in the fall. Gallery News: Design Domaine, Bernardsville, NJ has 12 of Johns paintings on daily display at their impressive gallery directly across the street from the train station. This art gallery is filled with some of the finest artists in the country so plan to stop by for a wonderful art treat. The Chestnut Hill Gallery, Germantown Ave, Philadelphia, PA has 4 of Johns paintings on daily display including a painting called, New Jersey Shore, 16 x 20 oil on canvas. Its very similar to one he donated to the Robert Wood Johnson Hospital fund raiser last year called, Ocean Grove, NJ. The gallery also has two paintings of sports legend Mickey Mantle, done by John several years ago. Both are 16 x 20 oils on canvas. Stinger Participates in Washington NJ Art Walk. Artist Reception December 15th. 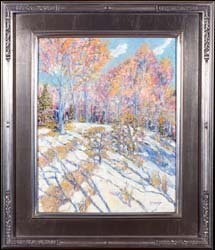 John Stinger, well known plein painter from Stewartsville, NJ will be participating in Washington, NJs Art Walk starting on December 15, 2011 through January 15th, 2012. Funding has been made possible in part by the Warren County Cultural and Heritage Commission. John will be exhibiting 13 of his new oil and acrylic paintings at JLA Embroidery store on W. Church Street entrance, 37 Belvidere Ave in downtown Washington and will be on hand to meet visitors at the shop during an Artist Reception held on Thursday December 15th from 5-8 PM. Free parking is right next store so please bring your family and friends to this free cultural event that features over 14 artists at various businesses located in the downtown section of this charming city. For more details call the store at 908-835- 8800 or 908-319-8957. Original American landscape oil paintings and limited edition giclee framed canvas prints inspired and created in the spirit of the arts and crafts movement. Another group of prints just introduced is called the Bungalow Style and are giclees on canvas, each personnally varnished and signed by the artist John Stinger. Stinger, originally from New Hope (Bucks County),PA has been painting for over 40 years. His work is collected by corporations, institutions,galleries and individual collectors. Warren County Arts: Talk entitled Plein Air Impressions- Art Marketing 101 at the Oxford Municipal Building, Oxford, NJ October 13th from 7:00PM to 8:30PM. I will be discussing 6 of my paintings done on location, as well has how to promote and sell paintings and prints during slow economic times. Q&A session starts at 8:00PM. Open Studio Sale: From October 15th through December 15, 2011 at my home studio Fri/Sat/Sun noon -5PM, Coffee/ Tea/Desert served. Please call in advance to set up appointment. 908-319-8957. Galaxy 2011 Art Show and Sale: 18th Annual Fundraiser to benefit Network of Victim Assistance at the Bucks County Court House , Doylestown, PA November 4-6,2011.Free Admission. VIP Preview Reception November 3, 2011. $35 admission. Call 215-343-6543 for information/tickets. This is a group show where I will be showing 4 new paintings and several new giclee prints. Lehigh Valley Art Auction: Sunday, November 6, 2011, noon -5 PM at Merchants Square Mall, Allentown, PA. I will be offering three recent paintings all priced under $1000 to help benefit local artists and the Lehigh Valley Arts Council. Call 610-437-5914. Design Domaine Gallery: 67 Mine Brook Road, Bernardsville, NJ 07924 908-502-5063 on going exhibition of 12 of my plein air paintings. Chestnut Hill Gallery: 8117 Germantown Ave, Philadelphia, PA 19118 215-248-2549 on going selection of my paintings. Spring Oil Painting Workshop: For more information regarding my limited open air painting workshop for beginners to advanced students, call for reservations. Limited to 6 new students, six weeks Tuesday and Thursday, 10AM-noon . 908-319-8957. 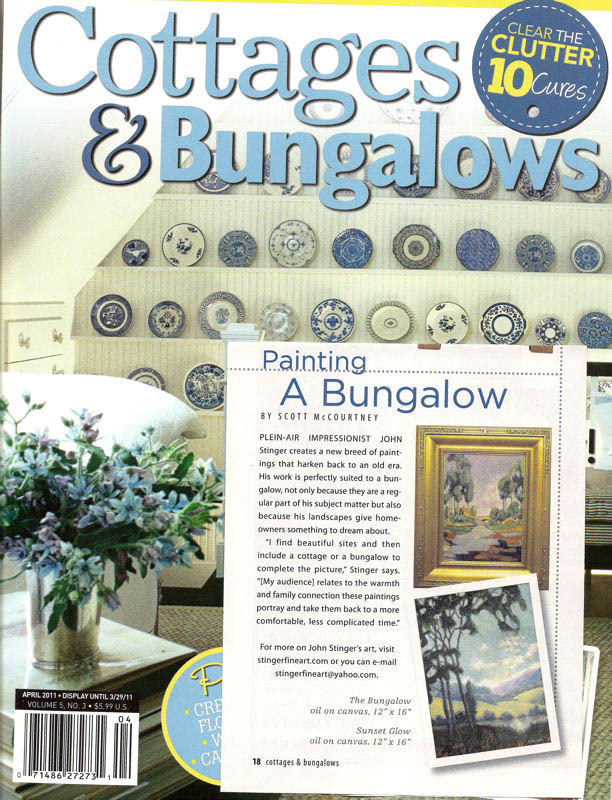 STEWARTSVILLE  John Stingers new painting entitled The Bungalow appears in the most recent October 2010 issue of Cottages and Bungalows on the editorial page. 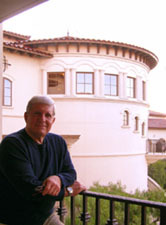 The editors responded referring to Stinger as a great artist with plans to feature the Stewartsville resident in a future issue of the magazine. John Stinger Showing New Paintings at Major Fall Events. 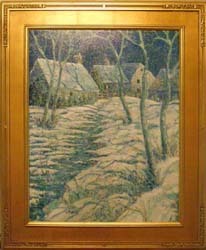 John Stinger, well known impressionist painter from Stewartsville, NJ and originally from New Hope. PA, will be participating in three major art events this fall. Stingers solo show at Stover Mill entitled  Plein Air Impressions II, will be held in Erwinna, PA October 9-10,16-17,23-24 and 30-31.This is a signature show for the artist and one his most popular events and will feature 40 of his original paintings. A special reception for the artist will be held on the opening day from noon-5PM. The NOVA Galaxy Art Show and Sale. will be held at the Bucks County Court House 3rd floor rotunda November 4-7, 2010. Proceeds from this spectacular event will benefit crime victims. A preview reception for 80 participating artists will be held on November 5 noon - 9PM. At Yellow Springs, John will be showing two paintings he recently completed for the 7th Annual Yellow Springs Art Show Poster Competition and Exhibition. The show opens with a preview reception on November 17 and runs through December 17th. Back From The Grand Tetons! Susanne's camera captures this spectacular view of bison moving to lower ground as the first winter snow begins in Grand Teton National Park. John and Susanne took a wildlife safari personal guided tour of the park and saw moose, antelope and magnificent herds of elk. The sound of a male elk trumpeting at early sunset to keep his herd together was a totally new experience and underscored the need to protect these elegant creatures. 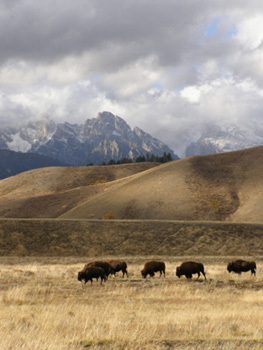 To see huge herds gathering in the lowlands against the backdrop of snow capped "Sleeping Indian Mountain" in Jackson Hole ,Wyoming is an unforgettable site. No wonder so many American artists are attracted to this area. John at an art show at the Mission San Juan Capistrano. 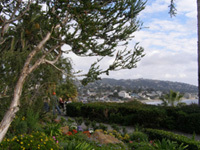 A view of Laguna Beach, next to the Art Museum where they attended an art show and lecture featuring the works of California landscape master William Wendt. 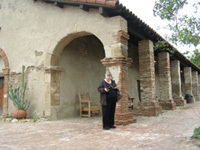 Susanne at the Mission- the oldest building in California and the inspiration for so many paintings that also led to the creation of American mission and arts and crafts furniture design at the turn of the century. John was recently invited to exhibit again in October 2010 at the beautiful Stover Mill Gallery located along the Delaware River in Erwinna PA in Bucks County. It is one of his favorite locations to paint, especially in the fall. 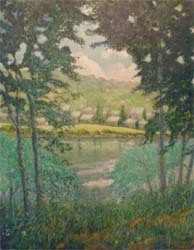 His initial show at the Mill was back in 2006 where he painted Summer Shadows in 2005 (see picture) which has become one of his signature works. Since that time, many local artists have now re-discovered the beauty of Stover Mill where it sits so perfectly along the banks of the river. But never content to sit on past success, John will be doing something very special for this show that will be sure to capture everyones imagination. We look forward to see what he has planned for this great show! John was recently accepted into the LAI, a prestigious group of international landscape painters that select members based upon their professionalism. A judging committee of selected LAI members reviews applicants works and decides who is admitted into the group. John recently returned from an inspiring painting workshop held in Los Angeles by internationally known painter Jeremy LIpking. 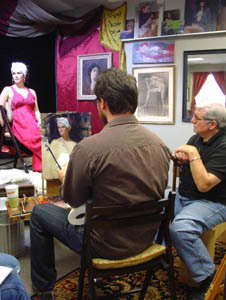 Pictured above is Mr. Lipking on the left demonstrating his approach to a portrait painting in oils as John studies his technique. Another session featured the use of a figure incorporated into a landscape setting. The entire workshop was intensive and included hands on direction as well as frequent critiques with an emphasis on brushwork, figure placement, as well as pre-planning the subject prior to painting. Lipking has had 6 one- man shows in New York and Los Angeles and was awarded the California Art Club Gold Metal. He also won Best in Show and First Place from the Portrait Society of American International Portrait Competition in 2006 and 2007.